What is a Beautiful Lawn? Fashion in gardens, like those in clothes and cars, began with the need to meet a utilitarian objective and then became the object for trend-setters to embellish. It is likely that the precursors of our lawns began in Africa where land around communities was cleared so people could see whether someone or something approaching was friend or foe. Grasses grew on this cleared land and was kept short by animals or through human effort. This practice was transported to Europe and England where eventually garden and landscape design became a more formal statement of the relationship between art and nature. Andre Le Notre designed the gardens at the palace at Versailles; he may have created the first LAWNS when he used imported grasses from Asia in large expanses of tapis vert or green carpet. Using exotic grasses made an important statement: Louis XIV was very wealthy and could afford anything he wanted. The French king became a trend-setter because other people wanted to "keep up with the Jones's". English gardens had traditionally been places in which beauty was combined with use, pleasure with profit and work with contemplation. In the mid 1700's, the famous Lancelot "Capability" Brown's work was praised for its modern style and its lack of formality and seclusion. (His nickname came from his frequent remarks about the gardens of country estates having great 'capability' for improvement). He used not only ground but also wood, water, rocks, buildings in his 'natural pictures'. As fashion ebbs and flows, however, by the end of the 1800's brambles and briars had become attractive, and his once-praised work was now described as being too formal, stiff and artificial. As the less wealthy became land owners, they imitated the gardens of the aristocracy by planting lawns and enjoying the pleasure of gardening in front of their houses, thus showing others that they didn't need to work their land to provide food for themselves. Today, modern gardeners can follow the trend setters of several centuries ago and feature green carpets in their gardens or they can create uniquely beautiful pictures by using different colours, textures, shapes and sizes of plants in arrangements that consider their own needs, comfort and tastes. Going natural may mean you need to accept a lighter green color, a few weeds, and mowing a little higher than you're used to. But you'll still have a healthy, good-looking lawn that's easier on the environment. And that's a good deal for everybody. Healthy soil is the single most important element of a garden. Growing healthy soil and a healthy garden is as easy as adding compost and other organic amendments to your soil. and even reduce your work! Compost is the dark, earthy material naturally produced by decaying plants and animal wastes. This mix of living and dead organic matter supports an intricate web of soil life, which in turn keeps your soil loose, moisture-holding, fertile and well-drained. Compost is a key element of growing healthy soil. Learn how to compost at home and then start creating your own. Spread two inches of Grade A compost and till it in to a depth of 6 - 8 inches, (15 -20 cm). Sandy or gravelly soils may need other amendments too - consult a certified landscaper for help with these soils. Generally, your lawn needs at least 8 inches, (20 cm), of good, compost-rich top soil. If you spend the time and money on creating a good base for your lawn you will save yourself a lot of expense and problems later. Rake the soil level, roll with a landscape roller, water to settle for a day, and rake again. Seed with an appropriate grass mix, and water daily if the weather is hot and dry until the lawn is well established. Do spend the extra dollar the buy the very best seed or turf available. A mix of 3 grass species is better than one species. The following grasses are known for their hardiness and have been tested for turf quality and resistance to many diseases and insects. A good basic mix would be 30% Kentucky blue, 30% perennial rye and 40% tall fescue. These do well in cool-season climates such as ours. Set your mower a little higherSet mowing heights up to 2 inches for most lawns (except 3/4 to 1 inch on bentgrass lawns) to develop deeper roots and crowd out weeds. Remove only one-third of the grass length at each mowing. Try to mow weekly in spring. Cutting too much at once stresses the grass. "Grasscycling" provides free fertilizer (at least 1/4 of your lawn's needs), helps lawns grow greener and denser, and doesn't cause thatch buildup. You can grasscycle with your existing mower. For best results, keep the blade sharp, mow when the grass is dry, and mow a little more often in the spring. Clippings left scattered on the surface will break down quickly. If there are clumps, mow again to break them up. Push mowers work great for grasscycling. For clean mowing that leaves no visible clippings, consider buying a "mulch" mower. They chop clippings finely and blow them down into the lawn so they disappear and won't be tracked into your house. The rechargeable electric mulch mowers are quiet, clean, and grasscycle very well. Get to know your soil. The correct pH factor for your soil is important since it affects the availability of nutrients to your plants. On a scale of 14 a pH of 7 is neutral. Less than 7 is acidic, more than 7 is alkaline. Many cool weather grrasses like a slightly acid soil of 6.5 pH. Dolomite lime, high in magnesium, increases alkalinity. Soils on the West coast are also often low in calcium. Apply slow-release lime in the spring or fall if a soil test shows a calcium deficiency or strong acid soil conditions, (pH less than 5). Don't be fooled by the colour. 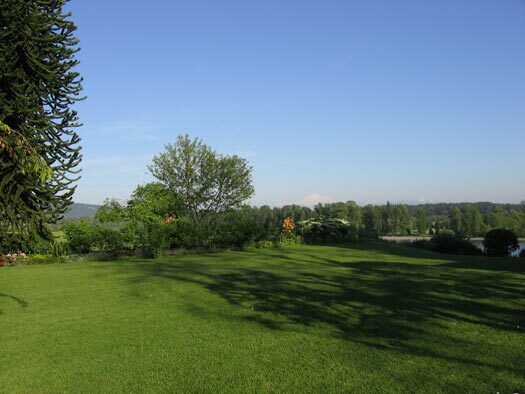 Healthy lawns are a medium green color, depending on the variety of grass. The darkest green turf, which many people strive for, is not in fact the healthiest turf. Overfertilized lawns are more prone to disease, thatch buildup, and drought damage. Mulching your lawn is the best fertilizer. Clover in the grass is beneficial because it adds and fixes nitrogen to your soil. Once or twice a year is all you need. With slow-release or organic fertilizers, you can fertilize just twice a year, in mid - to late May and again in early September. If you choose to fertilize only once, the fall application is most important. Slow release fertilizers release nutrients to feed the lawn slowly, and less is wasted through leaching or runoff into our streams. Look for the words "natural organic" or "slow-release" on the bag. When you fertilize, do it moderately. Remember, grasscycling returns valuable nutrients to the soil every time you mow! Water deeply but infrequently - Daily watering can actually hurt your grassGrasses do better when the whole root zone is wetted and then partially dries out between waterings. Avoid frequent shallow watering; that causes shallow rooting. Overwatering can promote lawn disease, leach nutrients from the soil, and waste water. Newly planted lawns will need daily watering if planted in the late spring or summer. Replant in September to avoid that chore, but be ready to water if it stops raining. Aerate the lawn if water won't penetrate because of soil compaction or thatch buildup. Dethatching will also help if there is heavy thatch buildup. Water about one inch per week during July and August. Use less in late spring or early fall-let the weather be your guide. Water slowly, or start and stop, so the water penetrates rather than puddling or running off. Sandy soils will need lighter, more frequent watering because they can't hold much water. Water early or late, not in the heat of the day. Consider letting the lawn go brown and dormant in the summer. Watering deeply but slowly, so it penetrates, once each rainless month will help support dormant lawns so they recover better in the fall. (Perennial ryegrass lawns on sandy soil will not survive if allowed to dry out completely.) Avoid heavy traffic on dormant lawns, or regularly water the play/high use areas to prevent damage. When rain returns in the fall, overseed any thin areas to thicken the lawn and help crowd out weeds. Watch the weather (don't water if it's going to rain). Signs of a lawn that needs more water include a duller color, and the "footprint test": grass blades stay bent in your footprint rather than popping back up. Or call your water utility for information on how to use evapotranspiration (ET) rates to match your irrigation to current weather conditions. Aerate compacted soil in the spring or fall to improve root development. Rent a power aerator for best results, or hire a professional. Note: these are large power tools that can be challenging to operate. The soil should be moist, and making two or more passes gives better results. The aerator pulls up soil cores onto the lawn. Rake or mow to break up the cores. The soil cores will help decompose thatch layers in the lawn. If your soil is deeply compacted (more than 2 inches-dig a hole to find out) find a landscape professional who has equipment that penetrates 6 to 8 inches to aerate for you. Overseed, after raking or aerating to expose soil, with a perennial rye/fine fescue mix designed for Pacific Northwest conditions. Talk to a knowledgeable nursery-person. A light application of "starter" fertilizer can help the seeds grow quickly and crowd out weeds. Dethatching 1/2-inch thatch layer can be beneficial, but much more than that can keep water, air and fertilizer from reaching the roots. Rent a power dethatcher and make several passes. This tool rakes up large quantities of grass to pull up the thatch. Rake up the thatch and compost it after dethatching. Then overseed to thicken the lawn and crowd out weeds. Note: these are large power tools that can be challenging to operate. April/May or September are the best times to aerate and overseed or to amend the soil and replant a lawn. You might want to start overIf your soil is very poor and compacted, it may be best to start again, fix the soil and replant. If very weedy, remove the sod with a rented sod stripper and start again. Another option is to use a sheet mulch. Use clean corrugated cardboard over the grass (mowing before laying the cardboard helps level the area). Overlap cardboard sheets six inches and keep the cardboard and mulch four inches from the base of any existing plants. Spread four to six inches of compost, topsoil, grass clippings or a combination on top and leave undisturbed for 3-6 months. In approximately 3 to 6 months the grass is dead and a new planting area is created. Till and overseed in the fall or spring. Covering the area with ground tree waste, wood chips or saw dust also helps prevent weeds from germinating. Get a soil test to find out what's missing and spread the amendments (like lime) recommended in the test results. Need to reseed your lawn? Spread two inches of Grade A compost and till it in to a depth of 6-8 inches. Sandy or gravelly soils may need other amendments too--consult a certified landscaper for help with these soils. Rake the soil level, roll with a landscape roller, water to settle for a day, and rake again. Seed with an appropriate grass mix, and water daily if the weather is hot and dry until the lawn is well established. Consider hiring a qualified professional for this big job. Healthy lawns naturally resist pests and diseaseCrowd out weeds and reduce post damage by promoting a healthy, vigorous lawn through proper fertilization, irrigation, and mowing. Improve thin areas with aeration and overseeding. A healthy turf will need far fewer pesticides. Some, like clover, may look fine. Target the problem weeds, leave the others. Remove problem weeds by hand in the spring and fall. Don't cover your entire lawn with 'Weed & Feed' just to kill a few dandelions. Pincer-type long handled weed pullers are available at many garden stores. They work well in moist soil, with no stooping. Pull dandelions when they're young (for best results get as much root as possible). However, most so-called weeds like dandelions are beneficial and beautiful. For example most of the dandelion plant is edible. The leaves are great is salads and the flowers atttract bees. Avoid 'Weed & Feed' or other chemicalsPesticides and herbicides can be harmful. These products may damage soil and lawn health and pollute our waterways. Some studies also suggest that use of pesticides may harm our health. Weed & Feed' is overkill. When you use 'Weed & Feed' products on your lawn, you're spreading both weed killers and fertilizer. 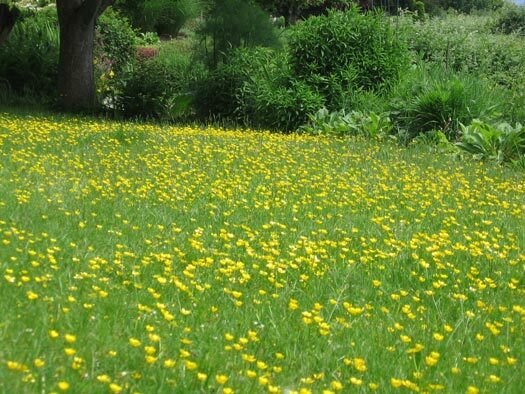 Think about it: you're putting herbicides on every inch of your lawn, even if you only have a few dandelions. Many professional landscapers don't like 'Weed & Feed' products because they waste money by using chemicals where they aren't needed. 2. 'Weed & Feed' may harm streams and lakes. Scientists doing water quality testing commonly find the three weed killers in most 'Weed & Feed' products (2,4-D, MCPP and dicamba) in our streams. Even if you don't live near the water, pesticides from your yard could travel through storm drains-untreated-to the nearest stream, lake or river. Quick-release fertilizers, commonly used in most weed and feed products, apply a quick and heavy dose of nutrients to the lawn, and are more likely to wash off into local lakes. This increases algae growth in lakes and reduces oxygen levels, killing fish and other organisms. 3. Pesticides may not be so great for you and your kids. Children are at high risk from pesticide exposure. They are more likely to be exposed, and they are especially sensitive to toxic chemicals. Some medical studies have found an increased risk of cancer and other health problems from the use of yard and garden pesticides. In a science journal review of 98 health studies related to the use of herbicides and other pesticides, half the studies found an increased cancer risk. 4. Pesticides and quick-release fertilizers may damage your lawn. Healthy lawns grow on healthy soil. Earthworms and other soil organisms keep the soil healthy. By moving through the soil, they allow water and air to penetrate, and they recycle thatch back into nutrients that the grass can use. Overuse of pesticides and quick-release fertilizers can seriously harm the health of your soil and increase lawn disease. This makes it much harder to grow a green lawn without relying on chemicals.